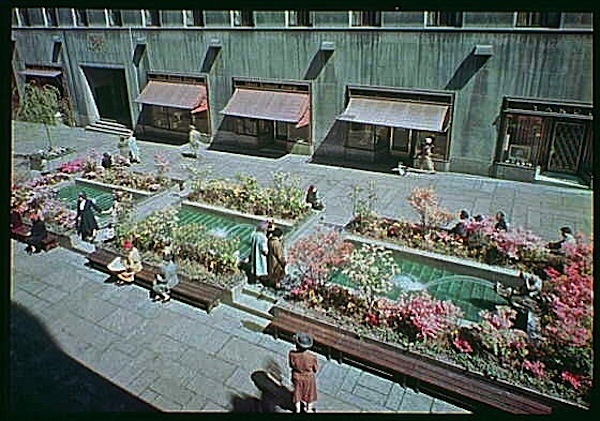 “Rockefeller Center, New York City, planted with azaleas,” April 1945, by Gottscho-Schleisner, Inc., via Library of Congress Prints and Photographs Division. Samuel Herman Gottscho worked as a traveling lace and fabric salesman before becoming a commercial photographer at the age of 50. 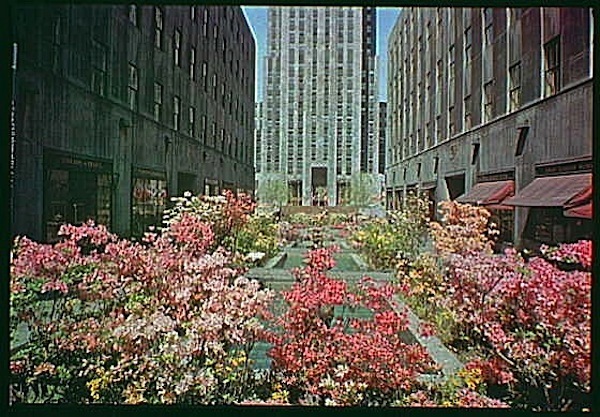 He specialized in architecture, but also regularly contributed to New York Times articles on wildflowers. He was awarded the New York Botanical Garden’s Distinguished Service Medal in 1967 for his photographs of plants. The Library of Congress holds 29,000 of his images in the Gottscho-Schleisner Collection (William Schleisner was his son-in-law and partner). I love Rockerfeller Center. As children our parents would take us every year to watch the lighting of the Christmas tree. As an adult I worked at the top of the tallest building. I never tire of walking though it.